Girl Scout Cookie season is no laughing matter. In my 25 years, I've learned that your geographical location does not alter the previous statement as being a cold, hard fact. When cookie season rolls around all bets are off. In fact, Girl Scout Cookies are such a hot commodity that someone in South Carolina saw it fitting to steal nearly $19,000 of cookies from a warehouse! I kid you not, y'all, this happened! The lesson here? Get your Girl Scout Cookies while you can, and be sure to stock up! While the variety of Girl Scout Cookies tempt that tastebuds of many, Thin Mints have always held a special place in my heart. Aside from just munching away on these classic cookies, I've been dying to bake with them! 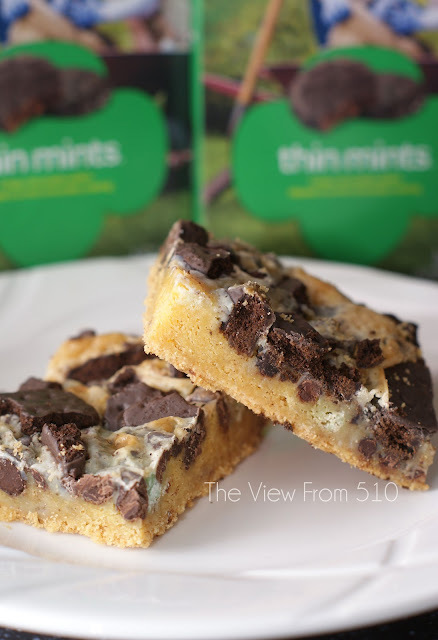 Once you've tried this Thin Mint Gooey Bar recipe featuring handfuls of Thin Mints, you will be craving them all day! I planned to share half this recipe with our neighbors; however, they didn't get to try a single crum. It's that good. 1. Preheat oven to 350 degrees then line a 9x13 baking dish with wax paper (if you prefer, just use a good coat of cooking spray). 2. In a bowl combine the yellow cake mix, egg and butter until they form a dough consistency. Press dough into prepared dish. 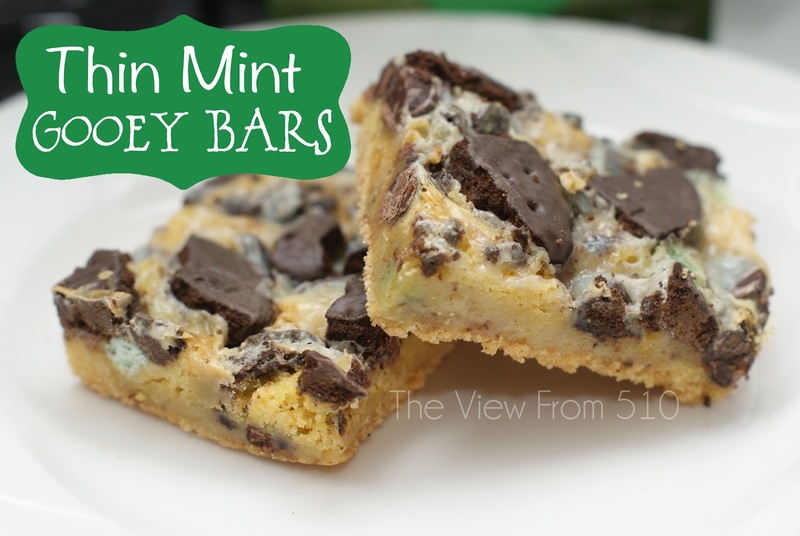 Cover with mint chocolate chips and mini chocolate chips. 3. Add the sweetened condensed milk by pouring on top. Last, sprinkle crushed Thin Mint Girl Scout cookies on top and bake for 30 minutes. 4. Immediately after removing from the oven, using a plastic knife to loosen the edges of the bars. Allow bars to cool completely before serving. Best served at room temperature. Important things to note: be sure to line your pan with wax paper and loosen edges of the bars with a plastic knife immediately after removing from the oven.